I'm so excited to share this post with you today!!! Are you looking for an easier way to gather produce from your garden? The answer to that question for me is yes. For quite sometime I've been using a basket or my shirt to hold all my produce as I pick through the garden, but this method just isn't working for me. What I need is something that would give me a hands-free way to keep my produce as I picked through my garden. I decided that a produce gathering apron was my answer. I searched all through the Internet for custom made gathering aprons, but all of them were either too fancy or too expensive not really what I was looking for. I needed a basic gathering apron that's more practical than fancy. Just something simple to give me a hands-free way to gather produce. Since I couldn't afford to purchase one, I thought the next best thing would be to make one, so once again I started searching online. 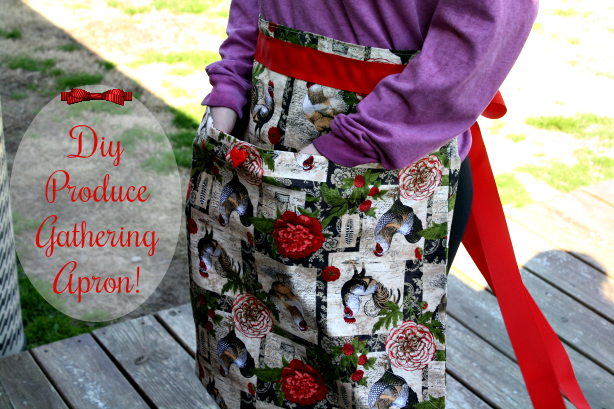 After almost giving up, I came across a post on Faithful Farm Wife how to make a simple gathering apron from a pillow case. I thought now that I can do!!!! I had a couple old pillow cases so I followed the directions and made one. I loved how easy the directions were and it turned out perfect. The only thing I didn't care for was the apron wasn't as large as I needed it to be and the lack of cute pillowcase colors and patterns. Sooooooo to solve that problem I went to the fabric store and purchased 1 - yard of fabric to make my own pillow case. 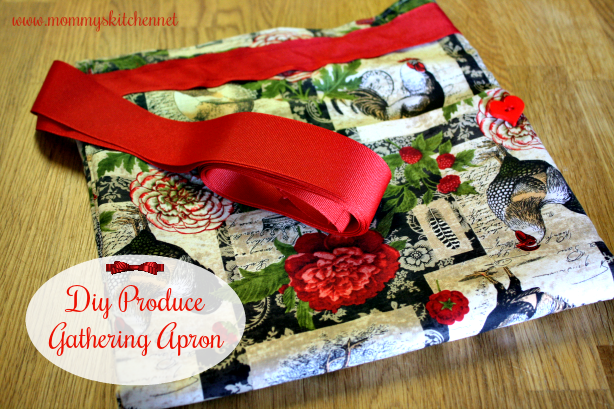 Once the pillow case was made, I did all the sewing for the apron and just like that I had a produce gathering apron that was not only pretty but also functional. I'm so addicted to this apron pattern that I've made three aprons in several different patterns and colors for gifts. 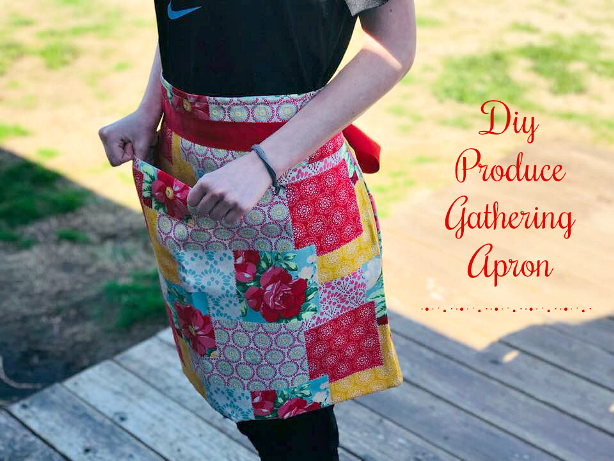 If you're looking for something for a gardener or homesteader consider making one of these simple gathering aprons. Let's get started!!!!! This is what you'll need: 1 - yard of fabric of your choosing, one bolt of wide ribbon in a coordinating color, thread, stick pins, scissors, decorative buttons (optional), iron and ironing board. To start we need to make a pillow case. 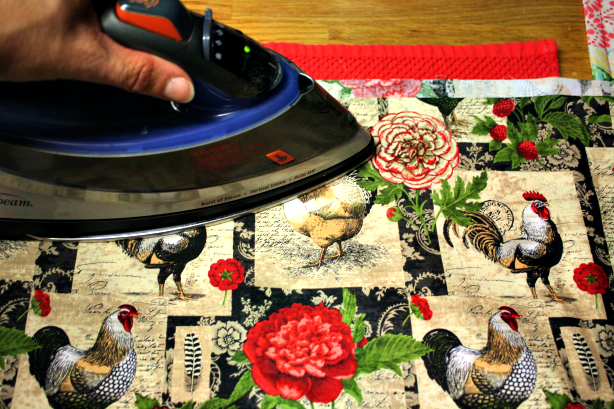 Fold the material in half with the print of the fabric on the inside. Pin the bottom and the sides of the material with stick pins. Sew both sides and the bottom leaving a 1/2 inch seam allowance. 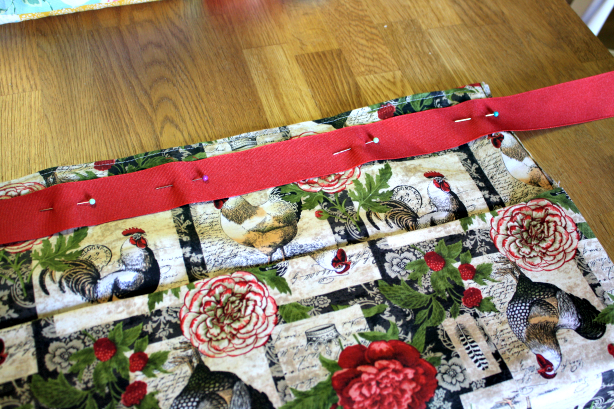 Sew a reverse stitch at the end to seal the seam. Make sure to leave the top open (like a pillowcase). Flip the material right side out so that your seams are on the inside. You should have one large pillow case at this point. Fold the ends of the material at the top of the opening about a 1/2 inch inside and iron flat. Do this on both sides. Sew the top of the opening closed leaving a 1/2 inch seam allowance. 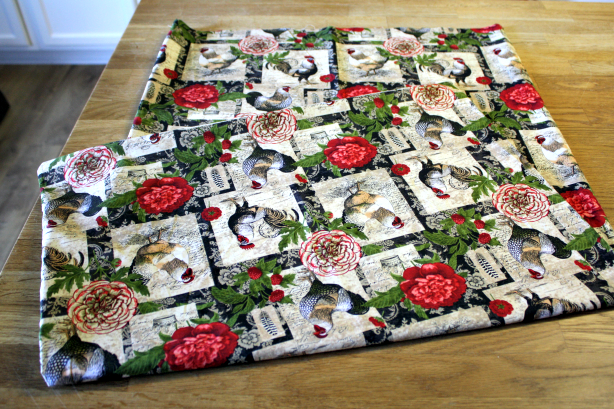 This is what it should look like at this point (a large pillow case with the top sewed closed). 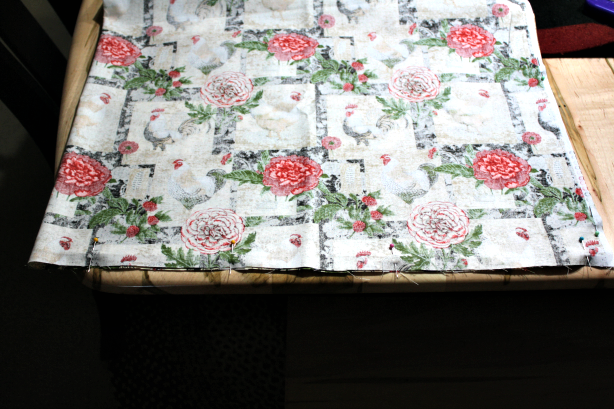 Now fold the bottom of the pillowcase 3/4 of the way up about 4 inches from the top. If you are using print material make sure you are folding the material so that the print faces upwards and not upside down. (I made that mistake on this apron). Pin the material on both sides and sew leaving a 1/2 inch seam allowance. Now you should have one large pocket. Flip the pocket inside out so the seams are on the inside. Now you should have one deep pocket. If you would like a two -pocket apron, sew a stitch up the middle of the apron starting from the bottom and ending at the top of the pocket. Do a reverse stitch at the end to seal the seam. Now you have a two pocket apron. Once you flip the apron inside out the side ends at the top of the apron stick out just a bit. Since I'm so OCD about things, I like to fold the fabric tabs inward and then sew them closed. This is optional, but I think it makes the apron line straighter. Now it is time to add the ties to your apron. Measure the ribbon around your waist to choose the length of your ties and cut to fit . I like my ties a bit longer so I can tie it in the back or pull the ties around and tie off in the front. Attach the wide ribbon at the top of the apron just above the pocket opening, pinning in the middle of the ribbon with stick pin. Hold each side of the ribbon up to make sure the ends are even before sewing. Sew two lines of stitches (one line of stitches at the top of the ribbon and one line of stitches at the bottom of the ribbon). I also sew at the sides of the ribbon as well for more durability. There you have have it!!! One deep pocket produce gathering apron! This apron can be used as a produce gathering apron or an egg gathering apron. I hand stitched a heart button in the middle of the fold of the pocket for decoration, but that's optional. Total cost for this apron was approx. $6.00. One yard of material was $3.97 and one roll of wide ribbon was $1.97 purchased at Walmart. I already had thread and the decorative buttons. The heart buttons were purchased at Walmart for $2.00 for a packet of 12 buttons. This is what it should look like at this point (a large pillow case with the top sewed closed). 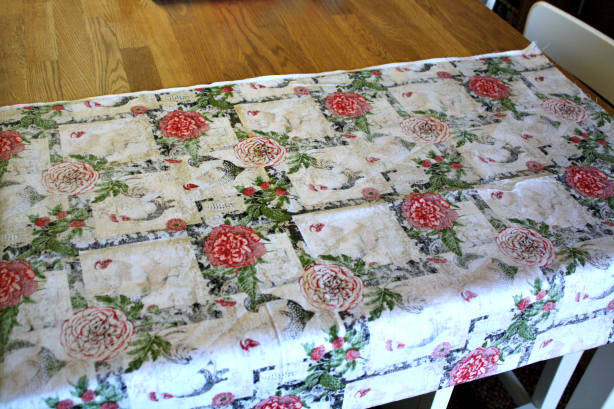 Now fold the bottom of the pillowcase 3/4 of the way up about 4 inches from the top. If you are using print material make sure you are folding the material so that the print faces upwards and not upside down. (I made that mistake on this apron). Pin the material on both sides and sew leaving a 1/2 inch seam allowance. Once you flip the apron inside out the side ends at the top of the apron stick out just a tad. Since I'm so OCD about things, I like to fold the fabric tabs inward and then sew them closed. This is optional, but I think it makes the apron sides straight. Now it is time to ad the ties to your apron. Measure the ribbon around your waist to choose the length of your ties and cut to fit . I like my ties a bit longer so I can tie it in the back or pull the ties around and tie off in the front. Attach the wide ribbon at the top of the apron just above the pocket opening, pinning in the middle of the ribbon with stick pin. 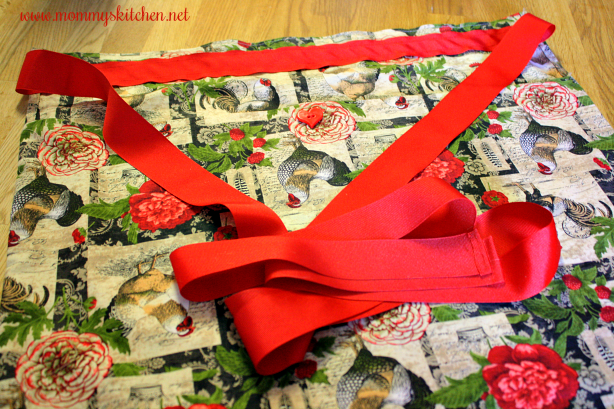 Hold each side of the ribbon up to make sure the ends are even before sewing. 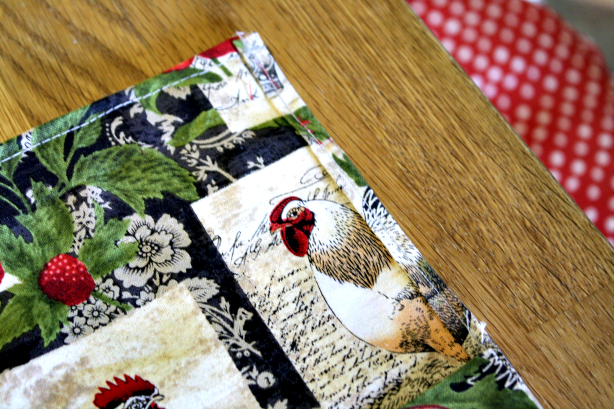 I had some material leftover from my Pioneer Woman Patchwork Tablecloth that I used to make two table runners, so I made a second gathering apron using the same method. What a darling apron / apronS. 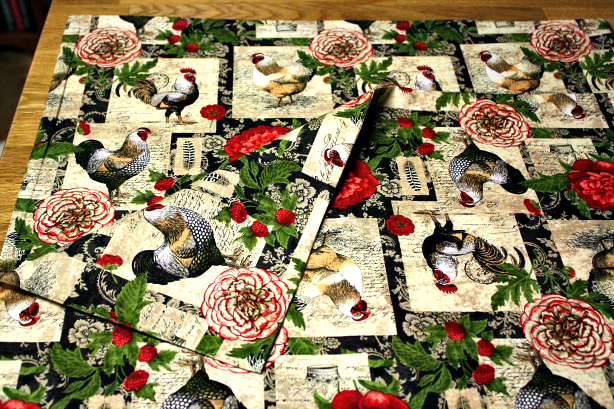 Absolutely love that farm chicken fabric. I'm an apron kind a gal. 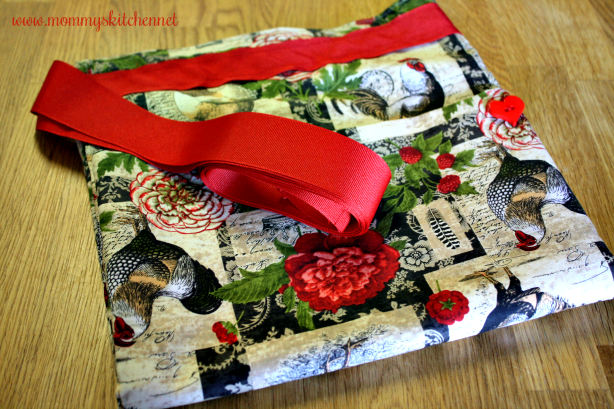 In fact I just made me a couple of aprons just by using some pretty kitchen / T-towels and wide ribbon. Also have made aprons using old blue jeans. So fun and easy to make. Have a great day Tina and a wonderful week. I got the farm fabric at Walmart of all places!! 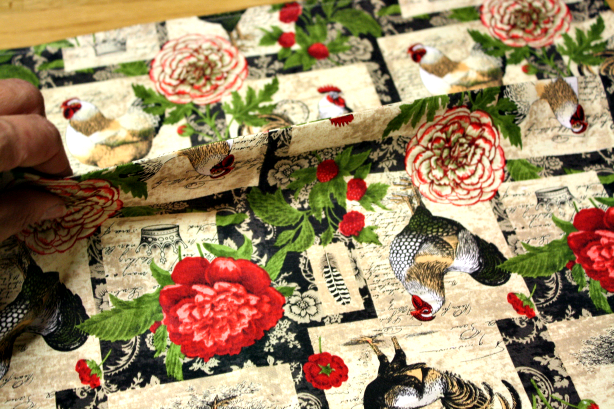 Our fabric department is pretty decent, so they have various patterns to choose from. I also made a vintage style one in black and white with red cherries and red ties for my sister in law. This apron is going to make things so much easier in my garden this year. The fabric looks so cute, I love the pattern. Thank you for sharing the tutorial!